A Week’s Recap from the Professor – Nicola Denzey Lewis, Ph.D.
Hello all! I wanted to grab the opportunity to contribute to this blog for those parents following along from all over the world. We’ve just started the second week of our program and the comment I overhear from the students most often is “I can’t believe we’ve been here a week…it feels like we’ve known each other forever! !” The RAs Ashley and Peter and the On-site Director Daniel — all of whom are with the students virtually 24/7 — have done an amazing job building up a real sense of camaraderie; we hope and trust that these friendships and connections that we’ve watched build will last them for many many years. Of course, even though we’ve handpicked the very best staff team we could, without outstanding students themselves, this level of joy and engagement would simply not be possible. I will say that they are an absolutely terrific group: curious, friendly, kind, and smart. Not one student is marginalized or left out; not one student dominates. They support one another in, it seems, all things. As the professor in charge, I am amazed at their seriousness and level of participation. I’ve started each morning with a question: “Tell me one thing you learned yesterday” and each morning, twenty-three hands get raised, many offering more than just one thing. They are learning a tremendous amount (one of our chief goals, of course, for this academically rigorous program) and, I think, having a blast doing so (another one of our chief goals). I designed this program — brand new for Brown, although we’ve run a pre-college program here in another format for many years — to accomplish a few things. First, I wanted to introduce students to the range of ways to learn about Rome that broke the mold. To me, what makes Brown special is our open curriculum, which means that undergrads can pursue their academic interests without having to take a fixed series of mandatory courses. So as a parallel here in Rome, I’ve arranged visiting instructors who are archaeologists, historians, film producers, engineers, photographers, museum curators, visual artists, and poets. 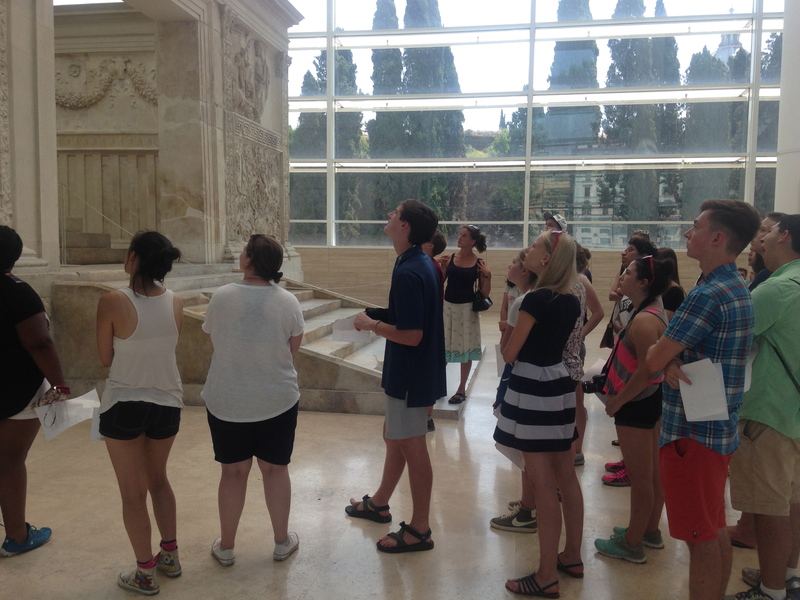 Second — and this pertains to the first — I wanted to bring in experts that I knew could make Rome come alive for high school students by giving engaging lectures and tours. So far it’s been great fun, and everyone has learned a lot along the way. 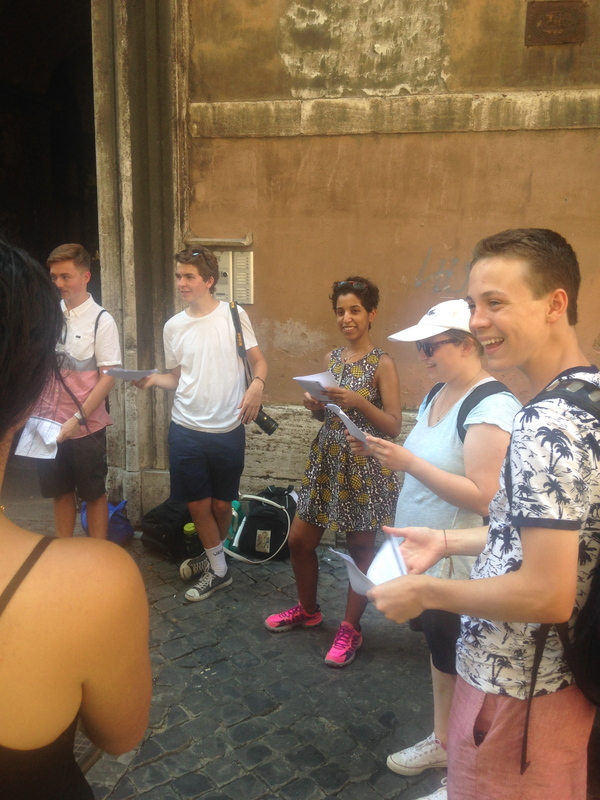 students racing around the Capitoline Museums, trying to outdo one another on an academic “scavenger hunt.” The winners get a bag of treats! the students reading and re-enacting the scene of Julius Caesar’s stabbing from Shakespeare’s play, on the very place where Caesar met his end. watching their expressions as they listened to our archaeologist site expert Catherine Baker talk about the eruptions at Vesuvius, and as they toured the ancient cities of Pompeii and Herculaneum. struggling with them to climb Vesuvius, and watching them try a well-earned shaved ice with fresh-squeezed Campanian lemons and oranges as they peered into the crater. Today we’re headed to the Colosseum, where we will have a special visit to parts closed to the public and, if all goes well, the students will have the unique opportunity to operate a full-size operational replica of a Roman lift designed into hoist live wild animals into the arena…but I’ll let our student bloggers tell you all about that! Parents, thank you for the opportunity to work with your kids. Each one of them, I can honestly say, is a joy and a wonder. The death of Caesar. Nouf (pink shoes) played Caesar with aplomb. 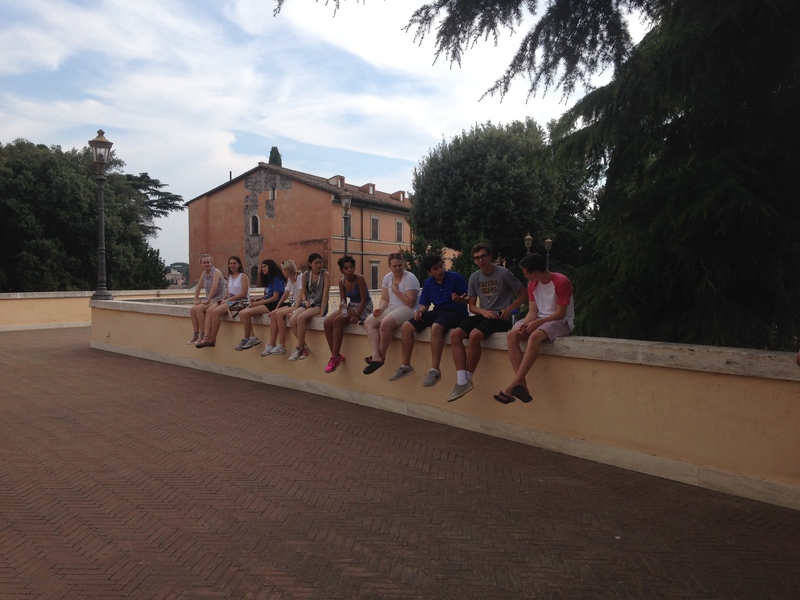 A few of the students taking a break at the Palazzo Caffarelli after an afternoon at the Capitoline museum. 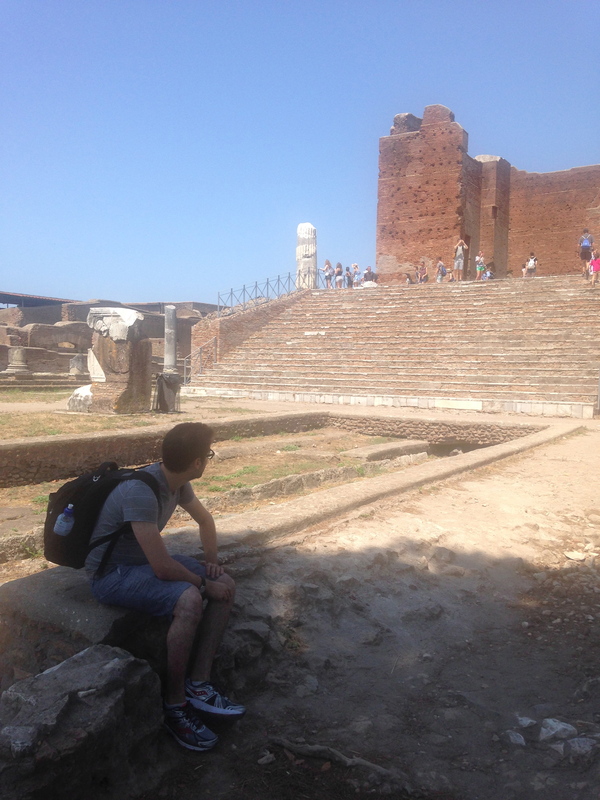 On-site Director Daniel Picus waits in the shade while some students brave the Capitolium in the ancient port city of Ostia Antica.